Softorino YouTube Converter can be tried out for 24 hours by requesting a key (given in exchange for your email address). Using it is just about as simple as you could imagine. Find a YouTube video you want to download for offline watching later. Click the big orange button on Softorino YouTube Converter. That’s it. The app monitors your clipboard. When it spots a compatible URL, it imports it to the app (you can do this manually, too). Then, when you hit “convert,” YouTube Converter does just that, sending the resulting file directly to your iDevice, as long as it’s on the same Wi-Fi network. That really is it. The resulting videos end up on your iPad inside the Videos app, under the Home Videos category. I’ve spent a half hour with the app so far and I’m going to buy it as soon as I’ve published this post. 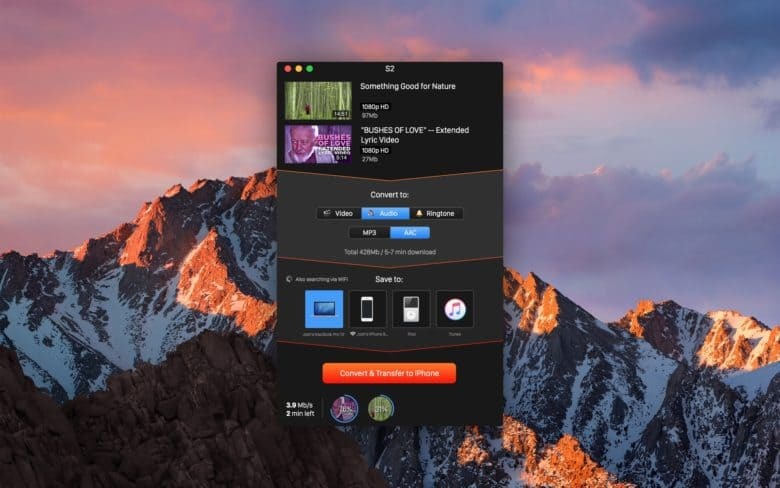 For iPhone and iPad users, the method described above is clearly the best and easiest option (just make sure to plug your iPhone or iPad into your Mac with a cable the first time you use Softorino YouTube Converter so they can get acquainted — after, that Wi-Fi works fine). But you can also add converted videos to iTunes, an iPod (!) or a folder on your Mac. And there’s more. You can grab video from many more places around the web — pretty much everywhere is supported — from 360p up to 4K. You can also choose to get only the audio from a file, or to download audio from places like Soundcloud. With audio, you can grab the original audio, or convert it to AAC or MP3. And if you’re still living in the late ’00s, then you can convert those tracks to ringtones. There’s not much more to say about Softorino YouTube Converter, other than it does exactly what you’d want in an app like this. It stays out of the way and just does its job.